If you have small white biting bugs in your home, it would be best to exterminate them as soon as possible. This is a guide about getting rid of tiny white biting bugs. I was wondering if anyone out there that is getting bitten by these little tiny white bugs that look like a grain of salt has found out how to get rid of them or stop them? I bought my home in Alabama back in '07 and ever since I moved in I've gotten bitten. I've had 5 different pest control people here and they say it's all in my mind or it might be the meds I'm on because I have dementia and take a lot of meds. I've been to 3 dermatologists, but they can't find anything either. One thing I did do that seems to work at night for me is to take a little Ben Gay and rub it on my neck and your feet. Now the worst place for me to get bitten is right here in this room where my computer is. I've bombed this house so many times and nothing seems to work. I've had other people on here saying bomb or spray your baseboards, but I have a small dog and a cat I worry they will get sick. I just hope someone out there can help us people who are getting bitten. Thank you. Wipe everything down with Lysol and get peramethin crème for you and wash all clothing in hot water and soap and plastic bag everything cloth for 2 weeks. Sounds like you have scabies. For the past couple of month's, I've been getting bit non stop on my couch. My boyfriend doesn't get bit, but my friend that come over do! We searched the entire couch, and there was nothing there! nope not scabies. I have them in Mississippi too. never had that before. til i moved here. I don't have dogs or cats any inside pets. my husband has chicken way Out back. i see these things flying my husband doesn't get bit or can he see them they are a lot smaller then fruit flies. they are where ever I put my pc and the light by my bed. I can't get rid of them either. I don't take meds either. if it was scabies you'd need more than lysol to get rid of that cause they get in your skin and spread. Take a bath in Epsom salt and coconut oil. Wash your hair separately. Also, follow what the other lady suggested. Wash everything on high heat. Turn your water heater up. Get a dehumidifier. That should help a lot. Vacuum daily. Clean your tub with scalding hot water and Lysol. I clean my whole house with this. Use Heppa filters on hvac and vacuum. Sounds like bird mites. You can also stick bedding in a hot dryer. How do you get rid of these white brownish bugs/mites that look like lint, but bite and then brown ones you can't feel these only when they bite, but they look like pepper. They get into your skin. The white and brownish ones get on your hair, finger nails, toes, and heels & bite. When I take a shower they are on me. They only get on me and bother me. They are on all my clothes, even though, I wash clothes in hot water and borax, it doesn't seem to bother the white ones. I was trying to take a picture, but not able to at this time. I see brown bugs coming out of Kleenex from Walmart and Sam's. Help. i have heard that bird mites can sometimes jump species and start afflicting humans. They are incredibly tiny almost invisible, and relentless. Strongly suggest that you see your doctor immediately and show her/him pictures of the bugs and your bites. They may be causing a medical problem that you are not be aware of. You should take this type of infestation seriously and call an exterminator and ask for a free estimate of service to get rid of your resident bugs and maybe ask at the same time where they think the bugs originated so you will know not to bring them in again in the future. If you cannot afford an exterminator's charges you should grab as many bugs as you can and place them in a zip-lock baggie. Take this with you someplace that has decent/knowledgeable bug people (maybe Ace hardware or True Value hardware, even try Lowe's or Home Depot) and keep asking until you find someone that sounds like they may know something about these bugs. 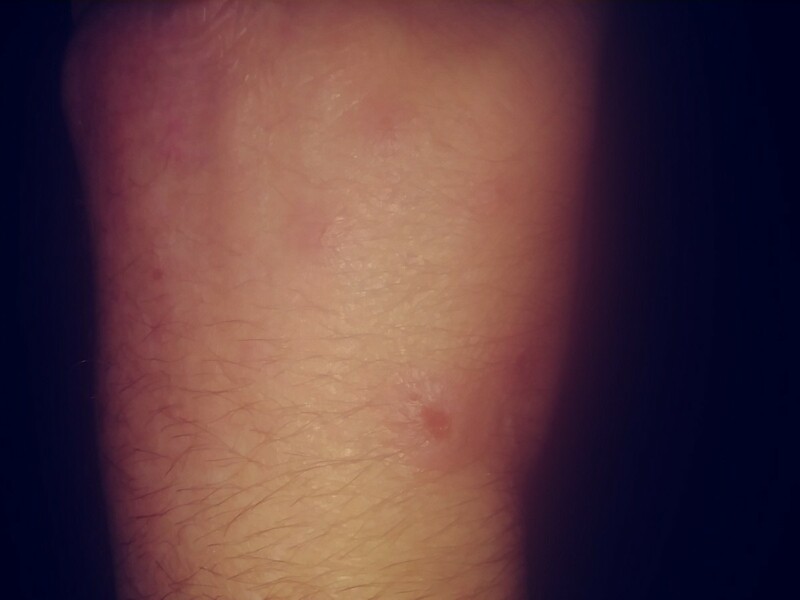 Try very hard to not let the skin bites get infected since you do not know what is biting you and this may create a problem with what medication to use. Keep skin clean and maybe use alcohol or hydrogen peroxide before applying an antiseptic cream. Try to get help as soon as possible because these bugs seem to be multiplying daily. I keep getting bitten by little white bugs. They don't bother my mom or brother. I can clean my room, take a shower, and I can still feel them crawling all over me and all in my hair. They are biting me all over my body. They leave little red dots that are turning into sores. How can I get rid of them because they are driving me crazy. They could be some kind of mite. You need an exterminator.